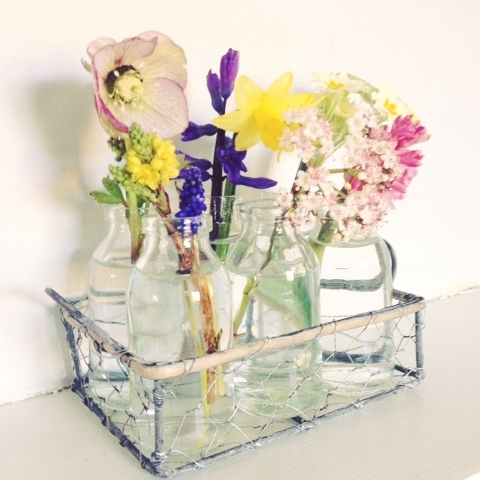 Spring blooms and sowing sweet-peas. I just love this time of year, and always know we've reached that turning point into spring when I pick the first of the pretty blooms! Such gorgeous pastel shades. It also reminds me I need to get things sown and growing, even more so this year as I have the job of growing all of the blooms for my sisters wedding party this August! The first seeds I sow are always sweet peas! I like to get them going from now onwards. I like to soak mine for a day first, many packets say no soaking required, but I find it helps to get them going. Then in about a 5" pot, I pop three seeds around the outside in grow bag compost that's already been watered, poke them down with your finger to a depth the packet suggests, then cover with cling film and pop on a warm windowsill. Keep an eye on them, and when they start nudging the cling film- remove it. Don't let the soil dry out, I always pop my pots on a tray and pour water in the tray for the soil to soak up, this helps prevent the seeds from rotting. Stay with me and I'll talk you through the rest of my tips in a couple of weeks. Also this week I'll be potting up my dahlia tubers, I always start these off in deep tubs in the greenhouse before planting on outside, my favourite is Avignon with its dinner plate blooms, and this year I've also added cafe au lait to my collection as it blew me away when I saw it in bloom at Wimpole gardens last year. Thanks for the tips about sweet peas. Just about to plant mine now so great timing. Hope they come through as I love their gorgeous colours. You are most welcome! They are one of my favourites too, the scent just gets me every time. Good luck!